We’re officially in prime wedding season. If you’re getting married this summer, then you should have most things finalized by this point. However, one detail that could still be on your radar list is the transportation. How will your guests get to the venue? Following up on that, is additional transportation required from the venue to the reception location? Failing to hire professionals – It might seem convenient to hand off transportation responsibilities to a friend or family member. As reliable as he or she may be, a number of issues could surface in this scenario. By hiring a professional charter bus service, you essentially eliminate the stress of coordinating multiple vehicles. Limiting your options – There are countless ways to get to your venue. Not really feeling a limo? The premier event transportation companies in Houston should have multiple vehicles to choose from, whether it’s a luxury towncar or a slick SUV for the entire wedding party. Forgetting about the guests – Are you planning on a number of out-of-town guests to be in attendance? Then you might want to consider booking a charter bus that can hold anywhere from 10 to 30 passengers. This helps you avoid having to give directions to lost guests or even put the ceremony on hold because of late arrivals. Scheduling transportation without a call sheet – Before the wedding, guests should know where they’re getting picked up and what time. Will some need to arrive earlier than others for pictures? Then be sure to coordinate with the charter bus company you hire. Not considering transportation for other events – Maybe you’re planning an elaborate engagement party, rehearsal dinner, or after party. Of course, there’s also the bachelor/bachelorette party to consider. Wouldn’t it also make sense to book luxury transportation for these pre-wedding occasions as well? 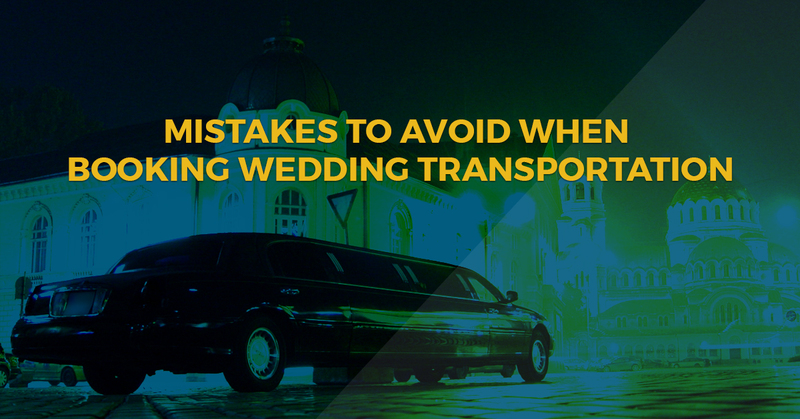 Now that we’ve explained what you shouldn’t do when it comes to booking wedding transportation, let’s discuss what you should do. Merlo’s Charters has provided dependable ground transportation to Houston residents for more than two decades. We understand that, on your big day, you want everything to be perfect. So then why on earth would you settle on a subpart charter bus service? Here’s the thing: we’ve grown to be one of the largest charter bus companies in southeast Texas. Family owned and operated, you can count on us to make your wedding day the best day of your life. In addition to event transportation, we also handle executive transportation and road trip transportation. Merlo’s Charters can even serve as an airport shuttle. Merlo’s always puts customer satisfaction at the top of the list. It’s our promise to enhance your experience by making sure you and other passengers are comfortable, safe, and on time. If you’re interested in similar posts, be sure to check out the top tips for stress-free wedding transportation. Contact Merlo’s now to book your reservation.